The Neoprene is lined on the inside in black and is reversible if you prefer plain black. All the lens covers I make are made by myself by hand on a lock stitch and overlock machines, all the edges are overlocked to help prevent wear and elinimate fraying. The Neoprene is lined on the inside in black and is reversible if you prefer plain black. All the lens covers I make are made by myself by hand on a lock stitch and overlock machines, all the edges are overlocked for a more secure and better wearing edge. Pull cord fastening to rear of cover with internal flap to protect against rain when the lens is carried vertically from shoulder. Cannon EOS Camera bag - Padded For Camera And Two Lens . Condition is Used. Used once as purchased more lenses and had to buy a bigger bag. In very good condition , as new really. Thanks for looking. Shockproof foam padding Comfortable, adjustable and specifically designed shoulder strap. Designed to perfectly fit your device. Upper section is perfect for storing phone, wallet and other accessories etc. Canon EF100-400mm f/4.5-5.6 IS Neoprene Lens Cover & protection Woodland Green. - Quality 3mm thick neoprene (poor protection if any thinner, thicker can get in the way). - Comfort and insulation from handling cold lenses. A Tamrac Velocity 6x sling bag. Enough for a DSLR and a lens. Front compartmnt with sections for cards, filters etc. Interchangeable lenses for a camera can be expensive and sometimes irreplaceable if they are vintage. It therefore makes sense to keep lenses safe in a case or bag to avoid accidental breakage. 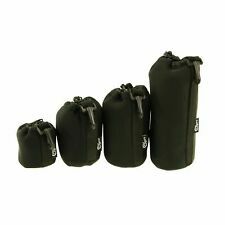 There are a wide range of different camera lens cases and bags available to suit your needs. Whether you are a professional or amateur photographer, you are sure to find the best case for you. The major camera manufacturers make cases and bags for specific lenses. It might be the right option for you to go for an officially branded product to ensure a good fit and high quality. If not, there are plenty of universal options to fit most brands of camera lenses . If you have only a few lenses, you might want to go for individual bags to protect them. For a bigger collection of lenses try a Peli camera case with divided sections to keep each one separate. 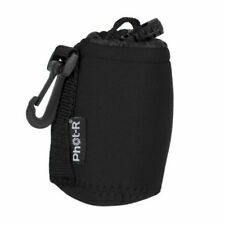 Most lens cases come with a shoulder strap for ease of carrying and some are collapsible for easy storage when not in use. Some cases have backpack straps to make carrying them even easier. Side pockets allow for storage of the camera lens cap or memory card. Handles are designed for easy grip so lenses can be removed and interchanged with one hand to avoid dropping them. Neoprene is a waterproof material making photography in the outdoors safer. With the slight feel of foam to protect your equipment further, you can trust cases made of this material to keep your lenses safe. Nylon is also weather resistant but is a thinner, softer material. Foam can be placed inside nylon cases to protect the optics. If you like the vintage look, leather cases might appeal to you to fit a more retro aesthetic.